Coming home from very lonely places, all of us go a little mad; whether from great personal success, or just an all-night drive, we are the sole survivors of a world no one else has ever seen. Currently: Drawing. In the traditional sense. Not so much in digital format as I've done so in the last few years. My graphite pencils and inking pens are getting a lot of mileage as of late, as it should. I've almost forgotten how much fun it is to just draw things I like, and draw things out of my dreams or at least pieces of what I remember (which is something that's been happening a lot to me lately). The scratching noise that a perfectly sharpened pencil tip makes when it makes contact with the paper. Filling in the lines and the in-between with black ink. It's the best. It's been fun, challenging, and keeps me sane. Discipline. Patience. Control. So much to learn about drawing. Learning about new techniques, observing, applying. I'm just soaking it all in. Movies. Graphic novels. Music. The art of storytelling in whatever format it may be. It doesn't matter. It all feeds the same beast. Truth is, I'm a bit preoccupied. Sitting over to my left is the current piece I'm working on...and it's all I can think about right now. I originally wrote this post at the end of October with the intention of posting it the first week of November but for some reason it stayed in the virtual file cabinet called Evernote for a whole month because I'm lame / I'm a bad blogger / I got real busy with stuff. Whatever. =P Anyways, I've unearthed this piece and going over it again. By starting something, we tend to have this desire to complete this task. Of course this goes hand in hand with focus and not procrastinating but from what I gather, we'll always strive to finish what we started. I just released my first novel a couple of months ago. I sure as hell didn't write that in a month or less. More like slowly punching letters in between projects for about a couple of years. Could I have done all that in less time? Absolutely. But regardless of how long it took to write, rewrite, and rewrite some more, the important thing is that it's done, and in channeling my inner Seth Godin, I shipped it. Come to think of it, penning the first draft was by far the easiest aspect of writing and publishing a novel in my own humble opinion. It's everything else after that took a bit of time. Of course there were hurdles along the way. I went through periods where I would set the novel aside and pick it up a month later. What happens is that I have to get myself reacquainted with the work again. So now instead of juggling two or three different stories all at once which I used to do and still have a slight tendency of doing. I just focus on one and complete it before moving on to something else. See, I'm kind of doing it again right now. Here I am typing this blog post while thinking about another blog post I'll be working on at a later date. Focus man, focus! After the rewrites, I had a hell of a time formatting this for some reason. I never had any issues with formatting any of my past works but for some reason this one was a doozy. Of course this was formatted for the print book as well so that was mainly the cause of my headaches. I think I spent an entire day, formatting, reformatting, and testing the sucker until i was happy with the results. Live and learn, eh? Then again. it's just like anything in life, it gets easier the more you do it. Despite its share of hair-pulling moments, this first novel is something I'm very proud of. Anyway, I've always known this work couldn't be contained in 1 volume. Even during its early stages I've already had ideas for at least a Book 2. So in terms of works in progress, I'll be working on Book 2 next year, that's the plan anyway, to stat work on it. I want to thank everyone who has helped me with my books, whether you bought it / tweeted about it / retweeted or whatever. It truly does help in getting the word out. I try to plug every so often on Twitter but I hate to be one of those folks that constantly peddle their wares. There's a way of doing it that is not intrusive. First 25 purchases gets it. You'll get a zip file with a pdf, epub, and mobi files of the novel. 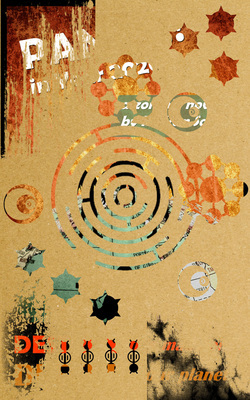 Stay tuned for the next blog post in which I'll briefly go over my process of cover art design. Your friendly neighborhood letter puncher. 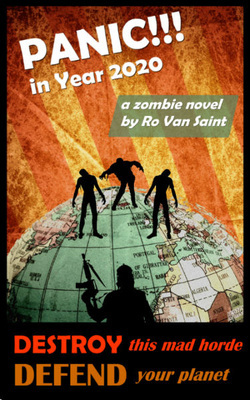 After making some minor changes on my proof copy and approving it, the print copy of my zombie novel, Panic in Year 2020 is now available on Amazon / CreateSpace. I also uploaded a new file for Smashwords and Kindle. I wasn't sure what to expect but was very pleased when I received my proof copy. I had such trouble resizing the cover art dimensions that I kind of halfway expected some errors on the hard copy. I changed the print size and paper color which changed the spine dimensions slightly. So what I got was a very attractive cover with vibrant colors. You can check out some pics I took. As always the cover design is one of my favorite parts of putting a new title together. My next blog post will be about the cover design process for this particular title, so keep an eye out for that. If you prefer your books in digital format, just go to my book section for the links. It still hasn't shipped out to Kobo, Barnes and noble and other retailers. I'm also waiting for the print and ebook version on Amazon to be linked together. Should take a couple of days. Guess what? My first novel is finally out, at least in ebook format. I've got the proof copy on my desk right now and as soon as I look it over and approve it, the print copies should be available in Amazon as well. Some of you may already know this as the novelization of a short story I released years ago via Smashwords. Many folks have emailed me in the past, asking when I'll write the rest of it, so here it is. Dun, Dun, Dunnnnn!!! You can also buy the ebook directly from me by clicking the button below. I should have autographed/inscribed print copies available from this site shortly for those who are interested. If you purchase an ebook copy and want that signed, you can click on the Authorgraph link on the upper right hand corner of this page. For the next blog post, I'll talk about the making of the cover spread which was inspired by old propaganda posters. I'll also post photos of my proof copy vs. the pdf image of the cover. As always, thanks for the continued support. Well, it's been a long time coming but here's part of the cover art for my first novel to be released very soon. Just a teaser image to whet your appetite. It's the novelization of a short story I've had out for some time - Panic in Year 2020. I've actually received many e-mails when I first released it asking when I'd write the full book. And so little by little, I'd add on to it until the first draft was complete. Back to the teaser image. I basically took the finished cover art, overlaid a texture on it and took several PS brushes to "reveal" different areas of what's underneath. I'll go over the actual cover art design process (if anyone's interested) later on. This is the cover that'll go with the digital versions. I've had to design a full spread (spine + back + front for the print edition). I originally planned on releasing this early summer but with the road trip with the family, that was put on hold along with other projects I had going. Anyway, the ebook should be available shortly through Smashwords and Amazon. I've pulled out the short story about a week ago to avoid any conflict within the Smashwords system. I'm also trying to get something set up so people can buy it directly off this site. I'm currently waiting on the proof of the print copy to ensure it looks good. When that's done it'll be made available on Amazon in print format. I should have some signed copies too for sale here. I'm just looking forward to completing this project finally and moving on to the next one. Belated Happy Easter (to those that celebrate it) and if you don't, I hope you had a great weekend as well. Keeping this post short and sweet or quick and dirty, depends on your preference. 1) Ghost Town, episode 6 (Bloodline) - this is the final installment for this particular serial fiction. 2) Another installment on my secret ebook experiment project. I've eased up on the short stories because I needed to go full throttle on the novels. I'm predicting that the next couple of months are really going to be a grind in terms of putting all the 2013 writing goals into motion. Currently, I'm still on schedule to getting specific works out this year that I told myself would have to be done. I've jotted down a rough daily schedule with minimum word counts needed to stay on course. So we'll see how that pans out. Well, well, well. It's that time again to check in and look back on what's been accomplished this past month. My original goal was at least 4 works by end of month. I only have 3 releases this month. 2 of them you know and the other one is for my other "experiment" which I mentioned on my January post. Being sick for about a week and a half really took its toll on not only the productivity and workload but also on getting back on the saddle. Eating healthy doesn't help much when you live in a densely populated metropolis. Damn you germs! Curses! Ghost Town: Episode 5 - I thought I was going to be able to wrap the series up with this episode but it seemed like too much to cram into that one book so onwards with Episode 6 where I will attempt to conclude the story. Flipside, bizarre tales of the fantastic: TRANSIT - just another one of those weird short stories, the more I wrote of it, the stranger it became. Seems like an ongoing theme with some of my WIPs so I figured I'd give them a home with the Flipside series of stories. My secret experimental ebook was the third work I released this month. Approximate words written this month: 27,000. I wrote some late last night for the next Flipside book so that number is probably closer to 30k. Episode 6 of Ghost Town. Another installment of my ebook experiment. Another short story, and maybe finish the last few chapters of a novel. That about sums it up on the writing front. Other stuff I worked on, in no order of importance. Changed up the books page on this website, easier links to ebook shops. Bought another couple of domains for some new niche sites. Added another 200 or so Twitter buddies. Chatting w/ some cool & interesting folks in between work. That's all i could think of for now. The caffeine effect is wearing off. I better wrap this post up before I do something stupid like delete the entire post by accident. It has happened before. Now, let's see how much we can get done for March, shall we? So I've decided I was just going to do an end of the month blog post. Not due to laziness but because it just doesn't make sense to blog about writing when I could just be...writing. There will be times when there's actually something I can chat about in which case I'll post it up and share it with you. *First uploads of new & improved Sid Valentine story # 1 and # 2 on Amazon marketplace featuring new covers. I reformatted, rewrote, and corrected inconsistencies on Sid Valentine 1 & 2 and reissued them. Tweaked description and tags on all of the books. A lot of them are still showing up in the wrong categories but I have to give the shops time to adjust that. 13k words written on the first week of 2013. I've pretty much kept this pace steady for the entire month. Usually averaging at about 10.5k (at the very least) to 14k (at the most) per week. 5k tweets, 1200+ followers, good conversations. Increase of ~400 new twitter buddies. Might be small potatoes to many but Twitter happens to be my favorite social media hangout so I'm happy with the stats. Increase in book sales. =) Can't give an accurate % figure yet since other digital marketplaces are slow to report and there is a lag but strictly based on Amazon, it's an 8.3% increase (so far). - Finish up up Ghost Town series with episode 5, unless episode 6 is needed. - Continue work on another serial fiction I've already started under a different name and different genre. Don't ask me what it is because I won't tell you. It's just something I've been toying with. i can probably put out another 2 segments for it this month. - Plan out what I'll do with Ghost Town. Season 2 maybe? I have side stories in mind for the first season that might be an interesting addition. - Website tweaks, specifically the Books Section. Lots of reading, catching up on my Netflix queue, running & maintaining websites (it puts money in the account, I don't have anything against money), hanging out with my family, cooking and eating healthier. You know, life. It's a short one. Might as well pack in as much as you can while you're able to. =) What about you? What have you been up to? The time has come for another book release. This time it's for episode 1 of my YA Paranormal Mystery Serial - GHOST TOWN. I had to unpublish the first 3 episodes from Smashwords. I didn't realize that serial works went against their TOS. So I'll republish it there once the series is complete. Meanwhile, I'm in the process of making it available here as an epub and pdf, pending on how smoothly the transition goes. I still have to iron out some details. I'll announce it as soon as it's ready. Driftwood looks like your average small town. Friendly locals. Fresh air. Beautiful scenery. Except for the ghosts. They're everywhere. For some reason the town has a large concentration of paranormal activity and hauntings. No one knows for sure why that is. It's just always been that way. Most of the locals have learned to live with it. The Carters are no exception. Joe Carter comes from a family of paranormal investigators. He's learned the tricks of the trade from his folks but nothing can prepare him for what he's about to discover. Follow Joe as he uncovers and deciphers the clues left for him by those who came before. It's more like several little ideas rolled up into one. I've had a couple of YA stories jotted down for future projects (this isn't one of them). I don't stick with a particular genre. The real challenge is sticking with the schedule. The release date for each episode is biweekly or maybe even sooner if the writing goes well. The exciting part (and equally nerve-wracking part) is I don't know where the story is leading to exactly. I only have a rough idea of how each episode will play out. Right this moment, I have my notebook in front of me with an episode outline complete with possible cliffhangers. The way it looks right now, this might be a 5 episode deal but we'll see how that pans out. The only way to get this done is to write fast and furious. Hammer the words out, rewrite, check for details so that the story remains cohesive and ship it. If I obsess about every little detail, it's never going to get out.